Due to the simplicity of surgery and the robust behavioural outcome, chronic constriction of the sciatic nerve is one of the pre-eminent animal models of neuropathic pain. Within 24 hrs following surgery, pain hypersensitivity is established and can be quantitatively measured using a von Frey aesthesiometer (mechanical test) and plantar analgesia meter (thermal test). Austin, P. J., Wu, A., Moalem-Taylor, G. Chronic Constriction of the Sciatic Nerve and Pain Hypersensitivity Testing in Rats. J. Vis. Exp. (61), e3393, doi:10.3791/3393 (2012). Chronic neuropathic pain, resulting from damage to the central or peripheral nervous system, is a prevalent and debilitating condition, affecting 7-18% of the population1,2. Symptoms include spontaneous (tingling, burning, electric-shock like) pain, dysaesthesia, paraesthesia, allodynia (pain resulting from normally non-painful stimuli) and hyperalgesia (an increased response to painful stimuli). The sensory symptoms are co-morbid with behavioural disabilities, such as insomnia and depression. 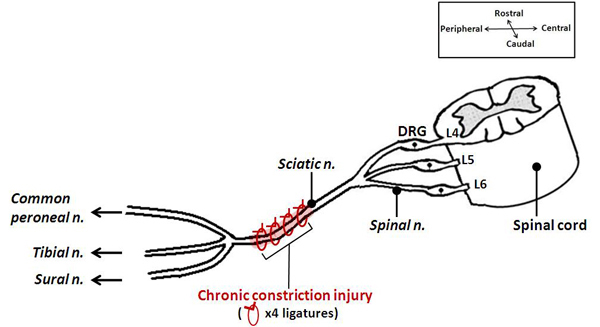 To study chronic neuropathic pain several animal models mimicking peripheral nerve injury have been developed, one of the most widely used is Bennett and Xie's (1988) unilateral sciatic nerve chronic constriction injury (CCI)3 (Figure 1). Here we present a method for performing CCI and testing pain hypersensitivity. CCI is performed under anaesthesia, with the sciatic nerve on one side exposed by making a skin incision, and cutting through the connective tissue between the gluteus superficialis and biceps femoris muscles. Four chromic gut ligatures are tied loosely around the sciatic nerve at 1 mm intervals, to just occlude but not arrest epineural blood flow. The wound is closed with sutures in the muscle and staples in the skin. The animal is then allowed to recover from surgery for 24 hrs before pain hypersensitivity testing begins. For behavioural testing, rats are placed into the testing apparatus and are allowed to habituate to the testing procedure. The area tested is the mid-plantar surface of the hindpaw (Figure 2), which falls within the sciatic nerve distribution. Mechanical withdrawal threshold is assessed by mechanically stimulating both injured and uninjured hindpaws using an electronic dynamic plantar von Frey aesthesiometer or manual von Frey hairs4. The mechanical withdrawal threshold is the maximum pressure exerted (in grams) that triggers paw withdrawal. For measurement of thermal withdrawal latency, first described by Hargreaves et al (1988), the hindpaw is exposed to a beam of radiant heat through a transparent glass surface using a plantar analgesia meter5,6. The withdrawal latency to the heat stimulus is recorded as the time for paw withdrawal in both injured and uninjured hindpaws. Following CCI, mechanical withdrawal threshold, as well as thermal withdrawal latency in the injured paw are both significantly reduced, compared to baseline measurements and the uninjured paw (Figure 3). The CCI model of peripheral nerve injury combined with pain hypersensitivity testing provides a model system to investigate the effectiveness of potential therapeutic agents to modify chronic neuropathic pain. In our laboratory, we utilise CCI alongside thermal and mechanical sensitivity of the hindpaws to investigate the role of neuro-immune interactions in the pathogenesis and treatment of neuropathic pain. Aseptic techniques should be used for the surgical procedure. Disinfect the surgical work surface with 70% ethanol and prepare in advance sterile instruments (e.g., fine scissors, forceps, and retractor), gauzes, staples and swabs by autoclaving. For multiple surgeries, clean and resterilise instruments with 70% ethanol or a dry bead steriliser between rats. A surgical mask, hair bonnet and sterile gloves should be worn. For constriction of the nerve, prepare the chromic gut suture by cutting it into small pieces of about 3 cm length immersed in sterile saline, to prevent drying. For closing the wound, use commercially available sterile silk sutures. Anaesthetise the rat in an induction chamber using 5% isoflurane in O2, then deliver 2% isoflurane in O2 via a custom made facemask, and monitor the anesthetised animal during the procedure. Common alternative anaesthetics are inhaled halothane or intraperitoneal sodium pentobarbital. Ketamine, as an N-methyl-D-aspartate (NMDA) receptor antagonist, should be avoided since these receptors are important in the development of neuropathic pain. Shave the left hind leg of the rat. Then, place the animal onto a thermo-regulated heating mat at 37°C and apply lubricating ophthalmic ointment to the eyes. Sterilize the shaved area with three alternate applications of 70% isopropyl alcohol and iodine solution. With the rat lying on its chest/thorax, elevate left hind leg and hold in position with the femor at 90° to the spine using masking tape on the foot. Make an incision in the skin parallel, but 3-4 mm below the femor, and free the skin from the muscle surrounding the incision by cutting through the connective tissue. Using blunt scissors, cut through the connective tissue between the gluteus superficialis and the biceps femoris muscles. Use a retractor to widen the gap between the two muscles, allowing clear visualisation of the sciatic nerve. Using curved blunt-tipped forceps and micro-scissors, gently free approximately 10 mm of the sciatic nerve (proximal to the sciatic trifurcation) from the surrounding connective tissue. Under the microscope and a good light source, tie four ligatures (chromic gut 4.0, Ethicon, USA) with a double knot, 1 mm apart, proximal to the trifurcation of the sciatic nerve. For each ligature, start with a single loose loop, then grasp the two ends close to the loop and tighten until the loop is just barely snug and the ligature does not slide along the nerve. To hold the loop in its proper position, place a second loop on top of the first to complete the knot. Finally, cut the loose ends of the ligature to around 1mm. Constriction of the nerve should be minimal, and immediately stopped if a brief twitch is observed, to prevent arresting of the epineural blood flow. Over tightening the ligatures leads to axotomy, and autotomy (self-mutilation), both unwanted side-effects which preclude successful pain hypersensitivity testing. Use sutures (Mersilk 5.0, Ethicon) to close the muscle layer and staples (Autoclip, 9 mm) to fasten the skin. Next, use iodine solution (Riodine) to sterilise the wound. Observe the rat closely during the anaesthesia recovery period, and allow it to recover in a separate cage with flat paper bedding (not the standard animal husbandry bedding), in order to prevent the unconscious animal choking. Before giving any post-operative analgesia investigators should consider the fact this may interfere with pain hypersensitivity testing. In fact, there is evidence that local application of anaesthetic, lidocaine, at time of injury can alter the development of neuropathic pain, and diminish the degree of hyperalgesia in the preceding weeks7. For further discussion on this matter see review by Bennett et al8. Daily handling of rats for several days before starting the experiment is recommended in order to accustom the rats to their handler, reduce stress and the risk of biting. Prior to behavioural testing, rats need to be habituated to the testing procedure and the animal enclosure. The testing environment should be kept quiet and well controlled, with constant temperature and humidity levels, and carried out at a similar time of day each testing session. Pain hypersensitivity testing should be performed several times before CCI (baseline) and at different time points after CCI, as desired. On the day of testing, place rats into the elevated mesh floored testing cage 15-30 minutes before measuring withdrawal thresholds, allowing cage exploration and grooming activities to cease and rats to become relaxed and stationary. Using a dynamic plantar von Frey aesthesiometer (Ugo Basile, Italy), position the touch-stimulator unit with the filament directly beneath the mid-plantar surface of the hindpaw, avoiding the metal mesh, and press the start key. This lifts the filament to mechanically stimulate the plantar surface of the hindpaw with an increasing force. Manual von Frey hairs are a series of increasing diameter filaments which are calibrated to induce a specific force when applied to the skin. They can be used as an alternative to an electronic dynamic plantar von Frey aesthesiometer for measurement of paw withdrawal threshold, as previously described4. There are also several alternative manufacturers of electronic von Frey aesthesiometers (e.g. IITC, USA and Somedic, Sweden). Record the mechanical withdrawal threshold from both injured and uninjured hindpaws, in a counterbalanced order. This device applies pressure to the paw and upon withdrawal reaction the system automatically records and displays the maximum force applied (in grams). If an ambiguous response occurs (i.e. in the case of ambulation or grooming), repeat the stimulus and record the threshold again. Licking or shaking of the hindpaw following stimulation is a sign of behaviour associated with pain. Repeat the mechanical stimulation 3 times with an interval of about 5 min between stimuli, record the thresholds, and then calculate the mean of paw withdrawal thresholds. The infrared (I.R.) heat intensity of the plantar test instrument should be adjusted before starting the experiment. In our laboratory, we adjust the I.R. intensity to give an average paw withdrawal latency of about 10 seconds in naïve rats, and we set the cut-off latency at 20 seconds to avoid tissue damage in case of failure to remove a paw. On the day of testing, place rats into the glass floored testing cage 15-30 minutes before measuring latency, allowing cage exploration and grooming activities to cease and rats to become relaxed and stationary. Using a thermal plantar analgesia instrument (Ugo Basile, Italy), position the infrared source directly beneath the mid-plantar surface of the hindpaw, and press the start key. This exposes the plantar surface of the hindpaw to a beam of radiant heat through a transparent glass surface. There are also alternative manufacturers of thermal plantar analgesia instruments (e.g. IITC, USA and Stoelting, USA). Record the withdrawal latency from both injured and uninjured hindpaws, in a counterbalanced order. This device automatically records the time taken (in seconds) from the onset of the thermal stimulus to withdrawal of the paw from the heat source. If an ambiguous response occurs (i.e. in the case of ambulation or grooming), repeat the stimulus and record the latency again. Licking or shaking of the hindpaw following stimulation is a sign of behaviour associated with pain. Repeat the heat stimulation at least 3 times with an interval of about 5 min between stimuli, record the latencies, and then calculate the mean of paw withdrawal latencies. 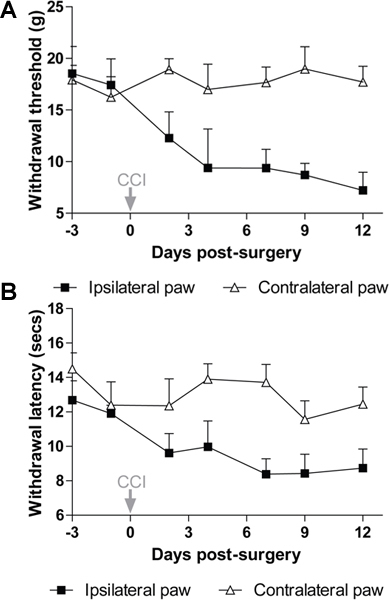 An example of mechanical withdrawal threshold and thermal withdrawal latency in the ipsilateral (injured) and contralateral (uninjured) paws of Wistar rats is shown before (baseline) and 2-12 days after CCI in Figure 3A, and Figure 3B. From these figures it can be seen that CCI causes a significant reduction in both mechanical withdrawal thresholds and thermal withdrawal latencies of the ipsilateral hindpaw, indicating the presence of mechanical and thermal pain hypersensitivity, both features of chronic neuropathic pain. Figure 1. A schematic illustrating the positioning of the ligatures in the CCI model. This animal model of neuropathic pain involves placement of four loose chromic-gut ligatures on the sciatic nerve, at mid-thigh level. It results in injuring only a portion of the afferents going to the foot and subsequent pain hypersensitivity of the hindpaw. Figure 2. 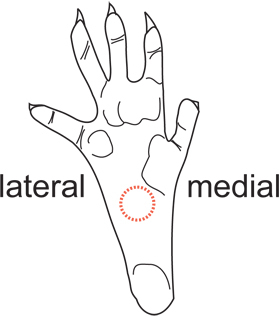 Diagram of the hindpaw area used for pain testing. The mid-plantar surface just posterior to the footpads, as indicated by the red dotted circle, is used for pain testing. This area is innervated mostly by terminal branches of the sciatic nerve. The heel and footpads should be avoided due to differential skin sensitivity. Figure 3. Pain hypersensitivity following chronic constriction of the sciatic nerve in rats. After CCI, there is a significant reduction in paw withdrawal threshold to mechanical stimuli (A) and paw withdrawal latency to thermal stimuli (B) in the injured (ipsilateral) hindpaw compared to the uninjured (contralateral) hindpaw (P<0.01 repeated measures 2-way ANOVA). Data show mean ± s.e.m, n=7 Wistar rats. CCI is a widely used peripheral nerve injury model of chronic neuropathic pain. It is relatively simple to perform, and produces robust and stable pain hypersensitivity for at least one month after injury. Following CCI, rats exhibit abnormal posture of the injured hindpaw (toes held together and plantar-flexed and paw everted), as well as repeated shaking, guarding and licking of the injured hindpaw suggesting the presence of spontaneous pain9. In addition to sensory dysfunction, several investigators have shown that CCI evokes behavioural disabilities, such as disrupted social interactions, sleep disturbances, depressive-like and anxiety-like behaviours10-13, however this is in contrast to the failure to find such behavioural disabilities by others14,15. CCI is therefore commonly used to investigate both the pathophysiology, and potential therapeutic agents for treatment of neuropathic pain. We describe unilateral constriction of the left sciatic nerve, however it should be noted that many experimenters have performed CCI on the right sciatic nerve, with similar pain and behavioural outcomes. Some investigators may find it easier to perform surgery on a specific side due to handedness, whilst others have switched sides within experiments to rule out any bias. It is noteworthy that several variations to the original procedure have been reported including using only 2 ligatures around the nerve16,17 and using suture material other than chromic gut such as plain gut and polyglactin (vicryl)18,19 in rats. In addition, the CCI model has also been modified for use in mice, where the procedure is identical, except for the use of 2-3 ligatures with various suture materials including chromic gut, nylon, and prolene15,20,21. One limitation of this model is the degree of variation amongst the rats subjected to CCI, due to variability in the tightness of the constrictions produced by tying knots with the sutures. This can be partially overcome by having an experienced researcher performing the surgery in a consistent way. Furthermore, the type of suture material used for ligating the nerve can also contribute to variability, and it is believed that chemicals from the chromic gut mediate some of the behavioural and neurochemical effects observed in this model19,22. Special consideration should be given to the choice of the rat gender (males versus females)23, age (young versus old)24,25, diet26 and strain27, which can significantly influence the development of pain hypersensitivity following CCI. Pain hypersensitivity testing, using an electronic von Frey aesthesiometer or manual von Frey hairs for mechanical withdrawal threshold and a plantar analgesia (Hargreaves) meter for thermal withdrawal latency, are well established and reliable quantitative measures of pain hypersensitivity in small animals. Their use, in combination with models of neuropathic pain, are widespread and allow for direct comparisons of paw sensitivity to mechanical and thermal stimuli across different treatment options, and between different strains of rats. It should be noted that other behavioural assays, such as the pin prick test and cold allodynia, are also used for testing CCI-induced pain hypersensitivity8. While the use of reflexive withdrawal from mechanical or thermal stimuli is the major measure of neuropathic pain in this model and others, it has recently been criticised for its poor correlation with human symptoms and the involvement of considerable experimenter bias28. Therefore, the use of additional paradigms such as operant measures of pain29 and spontaneously emitted behaviours30 would be beneficial. Nevertheless, despite these limitations, the CCI model and the paw withdrawal tests for measuring pain hypersensitivity are pivotal for understanding the mechanisms of neuropathic pain and identifying new analgesic targets. In our laboratory, we routinely perform CCI and measure mechanical paw withdrawal thresholds and thermal paw withdrawal latencies, in order to understand how neuro-immune interactions contribute to neuropathic pain31, and assess the potential of modulating the immune system to reduce pain hypersensitivity. Experiments on animals were approved by the Animal Care and Ethics Committee of the University of New South Wales, Australia, and followed guidelines issued by the International Association for the Study of Pain. The authors would like to acknowledge the original description of the CCI model by Bennett and Xie (1988). This work was supported partially by grants from the National Health and Medical Research Council of Australia (ID # 568637) and the NSW Office for Science and Medical Research to GMT. Bouhassira, D., Lanteri-Minet, M., Attal, N., Laurent, B., Touboul, C. Prevalence of chronic pain with neuropathic characteristics in the general population. Pain. 136, 380-387 (2008). Toth, C., Lander, J., Wiebe, S. The prevalence and impact of chronic pain with neuropathic pain symptoms in the general population. Pain Med. 10, 918-929 (2009). Chaplan, S. R., Bach, F. W., Pogrel, J. W., Chung, J. M., Yaksh, T. L. Quantitative assessment of tactile allodynia in the rat paw. J. Neurosci. Methods. 53, 55-63 (1994). Hargreaves, K., Dubner, R., Brown, F., Flores, C., Joris, J. A new and sensitive method for measuring thermal nociception in cutaneous hyperalgesia. Pain. 32, 77-88 (1988). Yeomans, D. C., Proudfit, H. K. Characterization of the foot withdrawal response to noxious radiant heat in the rat. Pain. 59, 85-94 (1994). Dougherty, P. M., Garrison, C. J., Carlton, S. M. Differential influence of local anesthetic upon two models of experimentally induced peripheral mononeuropathy in the rat. Brain Research. 570, 109-115 (1992). Bennett, G. J., Chung, J. M., Honore, M., Seltzer, Z. Models of neuropathic pain in the rat. Curr. Protoc. Neurosci. Chapter 9, (2003). Attal, N., Jazat, F., Kayser, V., Guilbaud, G. Further evidence for 'pain-related' behaviours in a model of unilateral peripheral mononeuropathy. Pain. 41, 235-251 (1990). Hu, B., Doods, H., Treede, R. -D., Ceci, A. Depression-like behaviour in rats with mononeuropathy is reduced by the CB2-selective agonist GW405833. Pain. 143, 206-212 (2009). Jesse, C., Wilhelm, E., Nogueira, C. Depression-like behavior and mechanical allodynia are reduced by bis selenide treatment in mice with chronic constriction injury: a comparison with fluoxetine, amitriptyline, and bupropion. Psychopharmacology. 212, 513-522 (2010). Monassi, C. R., Bandler, R., Keay, K. A. A subpopulation of rats show social and sleep-waking changes typical of chronic neuropathic pain following peripheral nerve injury. Eur. J. Neurosci. 17, 1907-1920 (2003). Roeska, K., Doods, H., Arndt, K., Treede, R. D., Ceci, A. Anxiety-like behaviour in rats with mononeuropathy is reduced by the analgesic drugs morphine and gabapentin. Pain. 139, 349-357 (2008). Kontinen, V. K., Kauppila, T., Paananen, S., Pertovaara, A., Kalso, E. Behavioural measures of depression and anxiety in rats with spinal nerve ligation-induced neuropathy. Pain. 80, 341-346 (1999). Urban, R., Scherrer, G., Goulding, E. H., Tecott, L. H., Basbaum, A. I. Behavioral indices of ongoing pain are largely unchanged in male mice with tissue or nerve injury-induced mechanical hypersensitivity. Pain. 152, 990-1000 (2011). Myers, R. R., Yamamoto, T., Yaksh, T. L., Powell, H. C. The role of focal nerve ischemia and Wallerian degeneration in peripheral nerve injury producing hyperesthesia. Anesthesiology. 78, 308-316 (1993). Grace, P. M., Hutchinson, M. R., Manavis, J., Somogyi, A. A., Rolan, P. E. A novel animal model of graded neuropathic pain: utility to investigate mechanisms of population heterogeneity. J. Neurosci. Methods. 193, 47-53 (2010). Kajander, K. C., Pollock, C. H., Berg, H. Evaluation of hindpaw position in rats during chronic constriction injury (CCI) produced with different suture materials. Somatosens Mot. Res. 13, 95-101 (1996). Xu, J., Pollock, C. H., Kajander, K. C. Chromic gut suture reduces calcitonin-gene-related peptide and substance P levels in the spinal cord following chronic constriction injury in the rat. Pain. 64, 503-509 (1996). Sommer, C., Schafers, M. Painful mononeuropathy in C57BL/Wld mice with delayed wallerian degeneration: differential effects of cytokine production and nerve regeneration on thermal and mechanical hypersensitivity. Brain. Res. 784, 154-162 (1998). Walczak, J. S., Beaulieu, P. Comparison of three models of neuropathic pain in mice using a new method to assess cold allodynia: the double plate technique. Neurosci. Lett. 399, 240-244 (2006). Maves, T. J., Pechman, P. S., Gebhart, G. F., Meller, S. T. Possible chemical contribution from chromic gut sutures produces disorders of pain sensation like those seen in man. Pain. 54, 57-69 (1993). Tall, J. M., Stuesse, S. L., Cruce, W. L., Crisp, T. Gender and the behavioral manifestations of neuropathic pain. Pharmacol Biochem. Behav. 68, 99-104 (2001). Chung, J. M., Choi, Y., Yoon, Y. W., Na, H. S. Effects of age on behavioral signs of neuropathic pain in an experimental rat model. Neurosci. Lett. 183, 54-57 (1995). Tanck, E. N., Kroin, J. S., McCarthy, R. J., Penn, R. D., Ivankovich, A. D. Effects of age and size on development of allodynia in a chronic pain model produced by sciatic nerve ligation in rats. Pain. 51, 313-316 (1992). Shir, Y., Sheth, R., Campbell, J. N., Raja, S. N., Seltzer, Z. Soy-containing diet suppresses chronic neuropathic sensory disorders in rats. Anesth. Analg. 92, 1029-1034 (2001). Yoon, Y. W., Lee, D. H., Lee, B. H., Chung, K., Chung, J. M. Different strains and substrains of rats show different levels of neuropathic pain behaviors. Experimental Brain Research. 129, 167-171 (1999). Mogil, J. S., Davis, K. D., Derbyshire, S. W. The necessity of animal models in pain research. Pain. 151, 12-17 (2010). Langford, D. J. Coding of facial expressions of pain in the laboratory mouse. Nat. Methods. 7, 447-449 (2010). Austin, P. J., Moalem-Taylor, G. The neuro-immune balance in neuropathic pain: involvement of inflammatory immune cells, immune-like glial cells and cytokines. J. Neuroimmunol. 229, 26-50 (2010). I am Deepika Saini from chandigarh, and i m pursuing my Masters in Pharmacy (Pharmacology) from chandigarh college of pharmacy,landran,mohali,punjab (India). As my ²nd year research project i got a topic COMBINED EFFECTS OF NSAIDs AND PKC INHIBITORS IN TREATMENT OF SCIATIC NERVE LIGATION INDUCED NEUROPATHIC PAIN , so i need the procedure for sciatic nerve ligation. Please help me regarding this , i will be really very thankful to you. The detailed procedure is described in the PDF of the article. Can you please email me the full text of the article by Bennett and Xie, 1988, i.e. "A peripheral mononeuropathy in rat that produces disorders of pain sensation like those seen in man." I need it for my thesis work. My email id is deepi.8dec@gmail.com. I shall be highly obliged. Posted by: kang hoon k.
I want to research the neuropathic pain in CCI model about MWT and PWL,so I want you can provide me the video to study the details of the research process.my email 244823865@qq.com. Thank you very much.